In a move that is likely to spell the end for a number of third-party Twitter clients, the social platform has shared pricing for its overhauled APIs. As expected, it's not cheap. Twitter delayed plans to deprecate the current APIs last month, but a new date has now been set for August 16th. 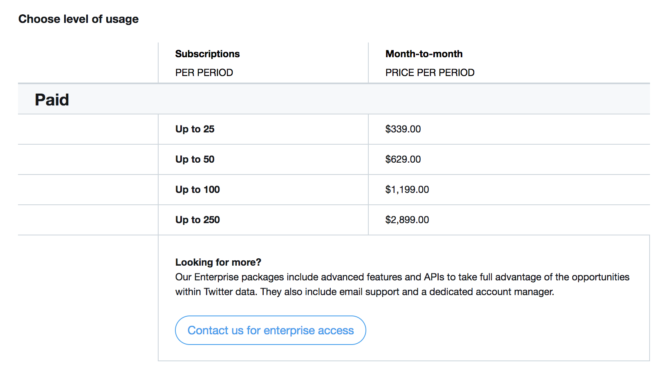 Developers of third-party Twitter apps will be required to sign up for the costly Premium or Enterprise plans to use the Account Activity APIs, likely pricing many of them out. The Premium package runs to $2,899.00 for every 250 users per month, and the Enterprise package is probably even more expensive — you need to file an application for a quote. For testing purposes, there is a Sandbox plan which is free for up to 15 accounts, but that's little consolation when a realistic plan for a good number of users is going to be so extortionate. A Twitterific dev has already stated that his app probably won't be able to afford the APIs, and together with Talon, TweetBot, and Tweetings, a website has been set up to raise awareness and lobby Twitter to change its mind. If you use any of the mentioned apps, they may no longer work as before or at all come August 16th. The devs have asked users and sympathetic observers to carry out the below actions in a bid to "get Twitter to constructively address this state of affairs before the August deadline." So get involved if you want to see your favorite Twitter client remain as it is. Thanks to Talon developer Luke Klinker, we now know a little bit more about how the new APIs will affect third-party Twitter clients like his own — it seems there's been a general misunderstanding about it. According to Klinker, the new APIs "aren't going to affect Talon at all and they certainly aren't going to push me out of business." Apparently, the new APIs will only cause problems for a very small percentage of Twitter clients that use push notifications and update timelines in real time. That doesn't apply to Android Twitter clients, on the whole, but may be more damaging for iOS and desktop apps. Unfortunately, it seems that some of the developers of third-party apps may have themselves contributed to some of the confusion following this story around. The Apps of a Feather site, for example, implies that "your favorite Twitter app is about to break." Regardless, many will be pleased to learn that their Android Twitter client of choice isn't likely to change in any meaningful way thanks to these new APIs.